The transition to empty nesting was pretty easy for me. I mean I missed not having the twins around, but I was used to them being gone a lot. They travelled a lot during the summer for one thing. Plus, they were so busy the last few years of high school, my time with them kept shrinking. That said, most people have one or more kids left at home after one goes to college. Having just the twins didn’t give us that luxury. It was tough because boom, the house was empty. You plan, you think about it, and you mentally prepare yourself, but then just like that, it gets a little weird in the house. DO NOT get me wrong. We raised the twins to be independent, so I am happy, I am truly happy for my kids. I am enjoying myself and so are they. In fact, I love being an empty nester with more time now for several very important reasons. My sister had kids later in life and I get to play the role of “that aunt” to my young niece and nephew. And it gives me more time to travel. Granted I traveled before, but there is less involved now. I can pick up and take off on short notice. I only have to arrange for dog caretakers. 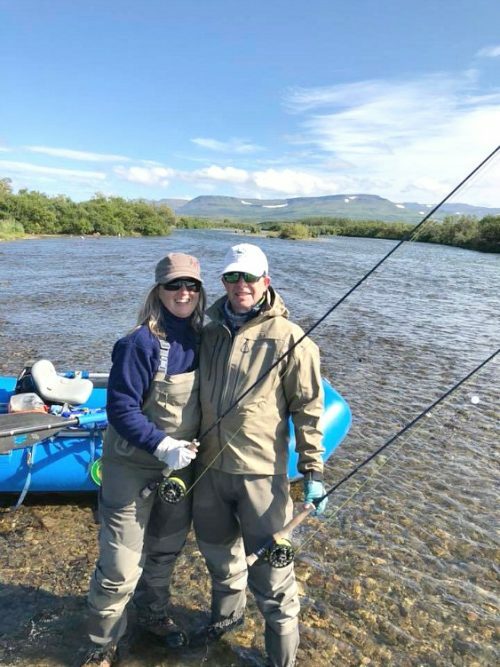 David and I on one of our fly-fishing get aways. Despite all the good that’s happening being an empty nester, I still do get weepy, mad, frustrated, and upset at times. Whether I am scrolling through FaceBook or Instagram and see “#FallBreak kids are home” or have friends with younger kids complaining that they have another carpool, I often think I miss that. One of the rare moments now when we’re all together. When the kids were in college, you could pretty much count on certain times they would be home or that you could plan to be together. You could simply look on line and have their schedules. But then came internships, work, significant others, and life…There are no longer those get times like fall break, winter break, and summer. You have to plan and they have to plan. We literally used a shared Google doc recently to figure out when we could do a winter get away. Our son has to be at his office the week between Christmas and New Year’s. So, we had to get creative. We ended up on Christmas weekend in NYC and our son will fly up for the weekend. Then my daughter and her significant other will fly with us Christmas day to Ambergris Caye, Belize and our son will then fly and meet us New Year’s weekend. Then everyone will leave by January 2nd to head back to work and we will stay the week to fish at Copal Tree Lodge in Punta Gorda, Belize. So, we made it work, because the priority was family time! This continues to be the number one reason we miss the kids. They can fix anything. FaceTime and text messaging with them is just not the same as having them here to fix it. It has been over four and a half years since the twins have left for college and to this day, I cannot figure out how to turn on the media room TV. My daughter still helps with transferring images to my computer as I am on my way to see her right now. I still do not know how the family Spotify works. I use to make the best snacks. I believe that kids used to be at our house simply for the food. Granted, I still feel like I was the cool mom, but in reality it was most likely about the food. I always had food in the house and real food. I remember one day a kid telling me that they “never have fresh fruit in the house”. When asked why, he said, “Because my mom says canned fruit lasts longer.” I always had homemade snacks, fresh fruit and whatnot. But my lunches! After I retired at the end of the twins sophomore year, I started to make lunch everyday. The kids were allowed to leave campus and I would make a delicious hot, homemade lunch for 8-10 kids. So, there was always delicious and good food in the house. My twins enjoying a quick bite at the kitchen counter. Now? Well, of course, we still have delicious and good food in the house, but there are not the amount of snacks or the choices we had when the twins were here. The food is now just for two people, so I limit choices and make sure it’s more for two aging adults and not teens. Add onto it being just the two of us the amount we travel and…you understand. My husband recently asked, “Where is all the food we had when the kids were home?” I was like, really? But agreed that I really miss all those snacks! Crazy I know! I miss driving everywhere. My friends will most likely be stunned when they read this, but yes I miss driving. It is not because I used to love driving, I disliked driving back then and I still do, but I miss what happened when I was driving. The twins got their licenses late and even once they did, they were so busy with school work, dance, gymnastics, and everything else that they often asked me to drive them from place to place. I miss that one-on-one time with them in the car just chatting. Sometimes they were so tired the ride was silent, but just being with them was amazing. Then there were the times with them together in the car and they would literally jump in the back seat together as if I was the Uber driver just to get caught up with each other. I just sat and listened. I miss those times. Now, I am back to just not liking being in the car at all. Those Halloween posts from all my friends with little ones were tough for me. One that really got me was from Audrey McClelland of MomsGenerations. She posted a picture of her five, plus what looked like all the neighborhood kids gathered in her family room ready to do the ever so sacred halloween candy exchange. I miss the noise of giggly girls all tucked in for a sleepover. The girls and their sleepovers. I miss my son and his friends sitting at the kitchen counter complaining about the ABs workout from coach. I miss the twins yelling from room to room for each other for help or to play a game. I miss going up to bed and then hearing a gaggle of kids come in the front door and know I was welcome to the kitchen to listen and make snacks. I would become part of the room and just be, just make snacks, and most importantly, just listen. There is so much more that I miss now with the twins as young adults, but I do not miss them. I am proud of who they are, what they are doing, and I am proud of my husband and I for raising them. But I do miss the snacks, the noise, the drive time, the tech support, and the guaranteed time with them. But if I miss them, until I have grandchildren, my sister’s kids are stuck with “that aunt”. What do you miss most about the kids being out of the house?